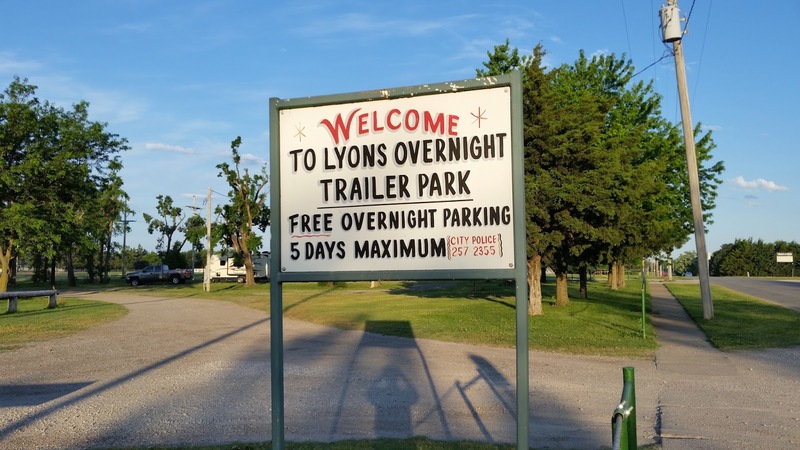 90 degree+ weather chased me into northern Kansas where I stopped for a few days at a little city park in the town of Lyons (population: 3737) that the city set up to allow RV'ers to overnight for up to five days with free electrical hookups. I'm always a sucker for free hookups! The park is not overly large with perhaps a dozen gravel/grass RV sites, some well shaded, others, like mine, pretty out in the open. The pickup detached from the Mini and ready to roam. 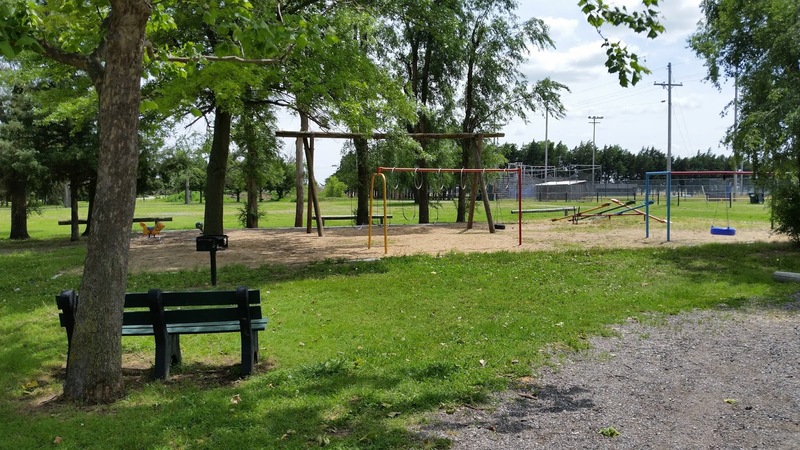 The park is located alongside a high school baseball field on the southwest part of town and is very quiet especially at night. Every day at 9am a city attendant came by the park to replenish/clean the restrooms while I was there and a mowing crew came by to cut the park's grass. 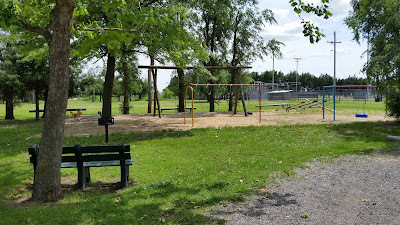 Park playground for the kiddos. Baseball field in distance. 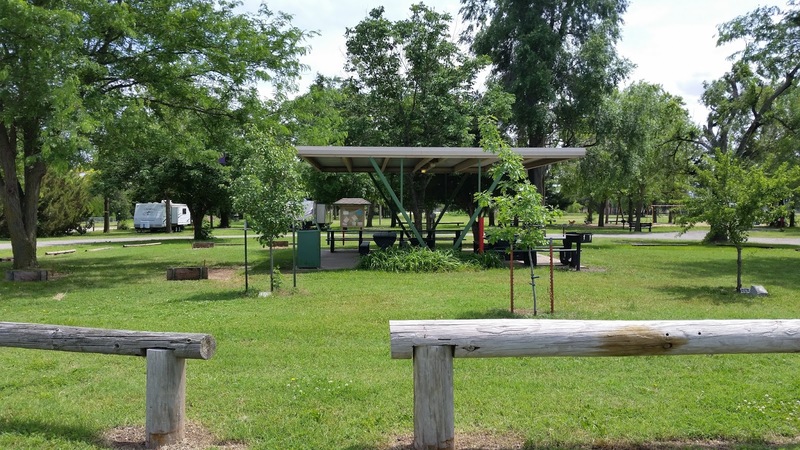 While there aren't water hookups for the sites there is a centrally located fresh water faucet in the middle of the park. The central picnic area with water faucet on the right. 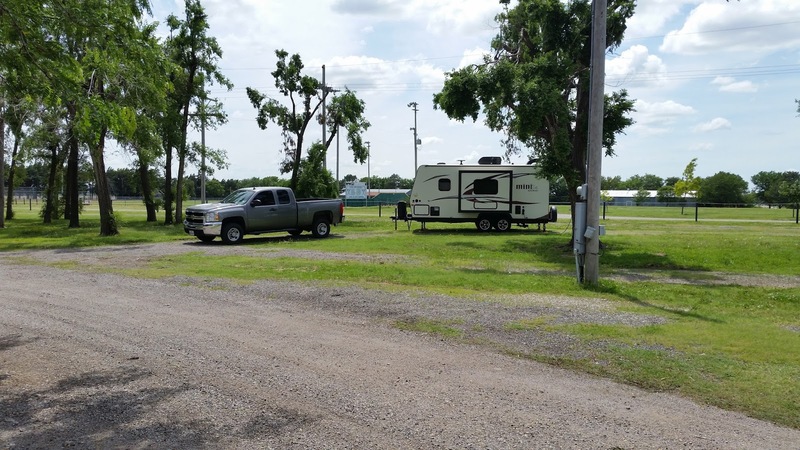 Of course the citizens of Lyons aren't hosting free electrical hookups out of the kindness of their hearts, they are hoping the RV'ers will shop and patronize their local businesses while camped there, I didn't disappoint them. 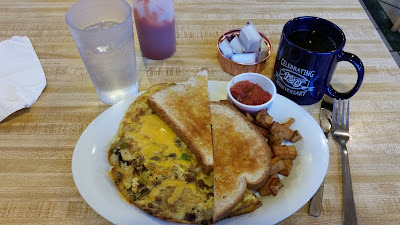 I ate two gargantuan breakfasts at a diner called Scrambled Sam's which I highly recommend for it's excellent omelets. The Taco Omelet at Scrambled Sam's. 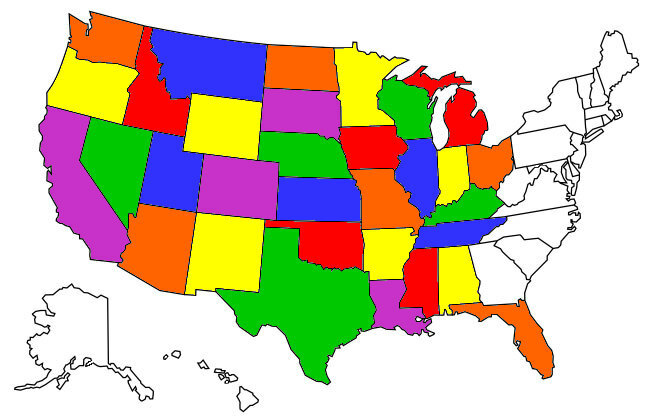 Almost too big to finish! I also replenished the Mini's beer supply at David's Liquor store in town (ahem) and filled up the truck at a Lyons gas station so, hopefully, the town got it's money's worth out of me in return for my stay. Lyons is a quiet little town without a whole lot of traffic so I had no difficulty in finding routes for my daily walking. 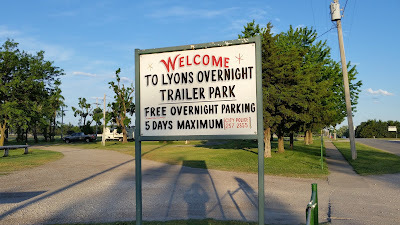 Lyons Overnight Trailer Park is a little gem if your traveling east or west on Kansas 14, I definitely plan on staying there again on my next trip through Kansas.